Clip 1 Clint scares the cameraman. Clip 2 Clint demonstrates a comfortable fall. Clip 3 Hervé is so full of ... modesty!. Clip 4 Martin ascends the Everest. Clip 5 Martin and Clint jump. Clip 6 Clint, Martin and Christine jump!. Clip 7 Clint skiing like a pro! Clip 8 Hervé had a go in front of the camera. Clip 9 Clint skiing in the woods. Clip 10 Clint gets his black Diamond. Martin and Hervé Pausing for Christine. Video does not work? Download Free Real Video Player. 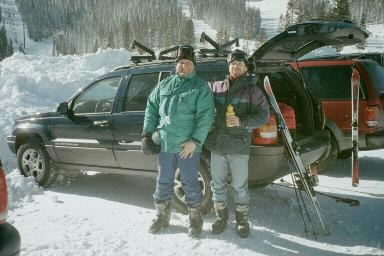 Here are a few pictures and video clips of our ski party during the first week-end of March 2001. Christina and Martin Lukowitsch were the local expert guides, organizers and hosts. Clint McCauley did the lodge reservations and exhibited some flabbergasting skiing skills. I just run the video and had lot of fun. Cool Deal!